Polemonium caeruleum ‘Bressingham Purple’ or Purple Jacobs Ladder is a very attractive deciduous clump forming perennial with green but purple tinted foliage. Although it grows part shade to full sun (full sun in cooler climates only) the foliage colour is best in semi shade and the purple colour is accentuated in autumn. The fragrant blue bell shaped flowers are held well above the foliage and appear in spring on deep red stems. Excellent in a cottage garden or a woodland garden, we have also seen them grown in pots and containers in a shaded position. Use it as a low growing border plant, or let it form a clump in the garden border. This an excellent filler plant, easy care, good foliage and attractive flowers. 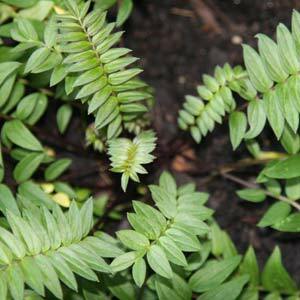 Polemonium caeruleum requires a humus rich moist but well drained soil, it does not like to dry out, especially over summer, and it is probably not suited to hot and humid climates. So a part shaded cool position in moist soil is best. Height – Will reach 30 – 60 cm in height, often pruned to 30 cm. Spread – Will form a clump to around 90 cm over time. Flowers – Purple to mauve or white depending on variety.